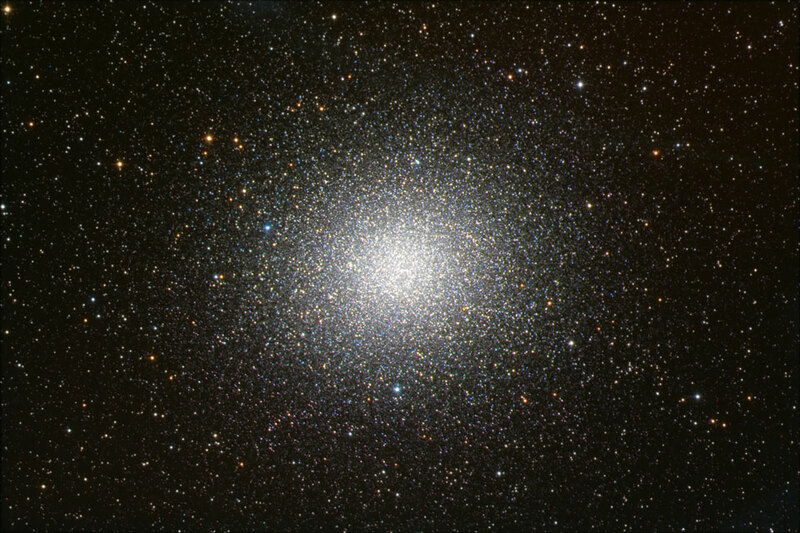 Globular Clusters – Abode for Life? The cosmos holds many wondrous things to capture our attention, but to me, the site of a globular cluster is just mesmerizing. These bejeweled orbs can contain tens of thousands to millions of stars in a sphere that can be about 100 light-years (ly) across. (Compare this with our Milky Way spiral galaxy that is approximately 100,000 ly across and contains on the order of 300 billion stars.) There are close to 150 globular clusters orbiting our galaxy, which is not unique; other galaxies have thousands or more in orbit about them. The very nature of the cluster, with its large number of stars so close together presents the opportunity for neighboring stars to disrupt the formation of planets or even steal planets from each other. Planets may also be ejected from a stable system by the gravitational influence of a passing star and follow their own path through the cluster. This is not to say that there would not be planets in stable orbits around stars in the cluster, although to date, no planets have been located in a globular cluster. The cluster itself makes it very difficult for us to detect planets orbiting its stars. Take a look at a previous post “Stars in Motion” which has a video showing the somewhat chaotic motion of stars in a globular cluster. It’s not the well ordered system one might intuitively expect from a gigantic ball of stars. To get a perspective on how dense a cluster is, consider that our nearest star, Proxima Centauri, which is 4.2 ly from us. If you were to map out a sphere at the center of a globular cluster with a radius of 4.2 ly it would contain on the order of 10,000 stars instead of two! These stars would be less than a light-year apart. A paper was recently published, “Globular Clusters as Cradles of Live and Advanced Civilizations” by Dr. R. DiStefano et al, which discusses the possibilities of planets forming around stars in a globular cluster and surviving long enough for life to form and flourish. But, this is conditional on the planets forming around stars that are located in a “sweet spot” in the cluster; that is, far enough apart that they don’t interfere with each other. Planets that form in the habitable zones of these cooler stars would be less prone to having their orbits disrupted by a passing star because these zones are close to these less massive, cooler stars. A benefit of the stars being in such close proximity is that it makes the possibility of traveling to or communicating with another civilization so much more practical and if advanced life formed, probable. Also, the high concentration of stars means that planets that have been ejected and not captured by another star may still receive enough light continue to nurture life, especially if the planets retain or generate enough heat to keep water liquid, even if under a layer of ice. All of this makes me wonder what it would be like to view the cosmos from inside a cluster or just outside of a cluster. The image below represents a possible view of a planet inside the cluster, some distance from the center. The ambient light from all the stars would make nighttime about as bright as dusk/dawn on our planet. Consequently, the beings populating this planet might have a great understanding of the stars around them, but their view of the universe outside of the cluster would be greatly hampered by this collection of stars. 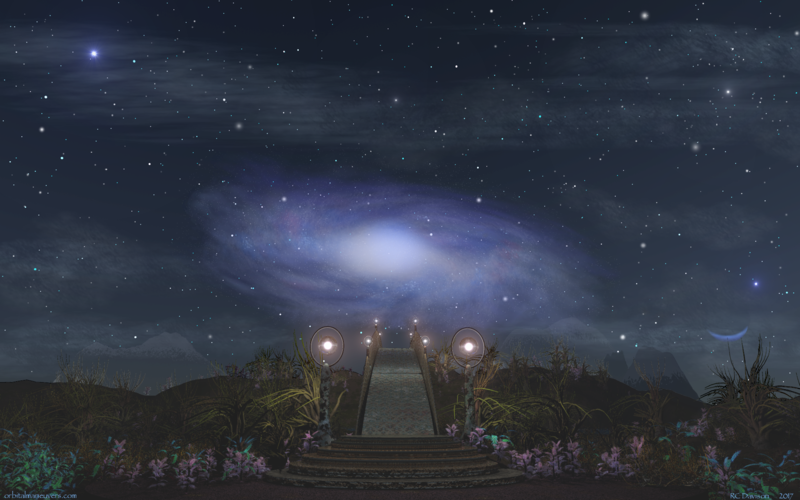 Check out the very interesting short story by Issac Asimov, “Nightfall”, which is about a civilization that evolved in a globular cluster on a planet with the six suns. They experience constant daylight except once every two thousand and forty-nine years when five of the stars align on one side of the planet and the sixth is eclipsed by a moon unveiling nighttime and all the wonders of the night sky, which they are very unprepared for. Whether globular clusters are abodes for life or not will not be answered soon. 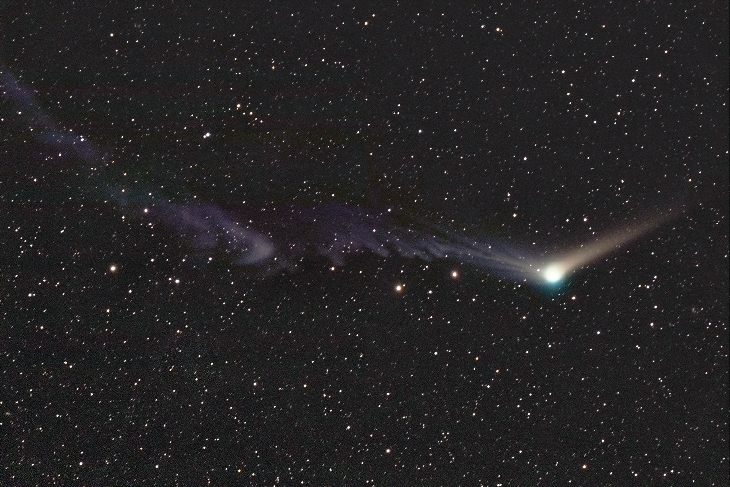 It’s just one more challenge for astronomers to unravel as they sharpen their skills in exploring our amazing cosmos. Most wallpapers evolve from an idea, or something I’ve seen during my daily journey through life. Starry Night actually started out as a desert scene and ended up with water and a whole lot of suns in the sky. The vast majority of stars in the Universe are made up of red dwarf stars or class M stars. They are smaller and cooler than our Sun and because of the fact that they are dimmer and cooler, they consume their hydrogen fuel at a much lower rate. This means that these stars are very long lived – on the order of 10 trillion years, as compared to our Sun, which will be around for about 10 billion years. Red dwarfs typically exist as solitary stars, but stars that are brighter than the red dwarfs tend to be found more commonly in binary configurations. A binary star system has two stars that orbit around a common center of mass. Stars can also exist in three, four or more configurations, but as you add more stars to the mix, the more unstable the system becomes. 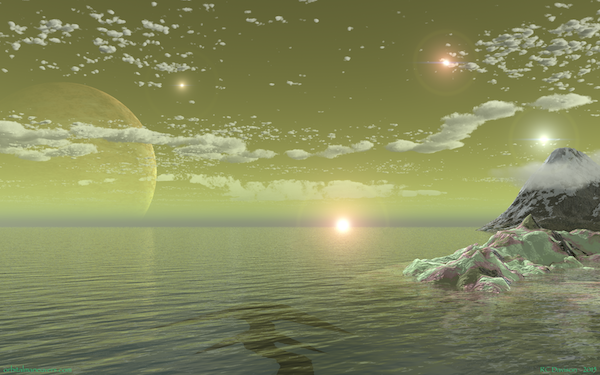 Planets can form in such multi-stellar systems and several have been uncovered by the Kepler mission. Starry Night is a multi-stellar system. The most interesting thing that occurred to me was that the inhabitants on a planet in such a system may never have a night sky with which to peer into the depths of the Universe! Imagine how much they would never know about the Universe. And, even more interesting is to consider their response when they manage to rise above their atmosphere and glimpse the cosmos for the first time. 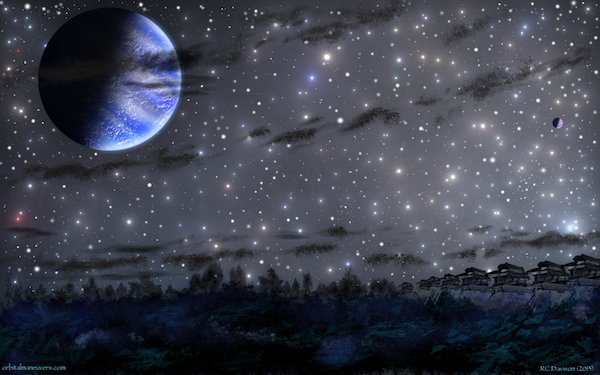 Enjoy Starry Night and visit the ORBITAL MANEUVERS web site for additional wallpapers and more. An Amazing Model of Our Universe! Astronomers, astrophysicists and cosmologists have a very difficult and frustrating life. They can’t touch the star, exoplanet, galaxy, nebula or other celestial object they are studying, nor can they send a probe as a surrogate to take a sample or direct measurement (aside from the few lucky planetary scientists who’ve had missions within our solar system). The topics of their interests lie at distances most people can’t even comprehend. 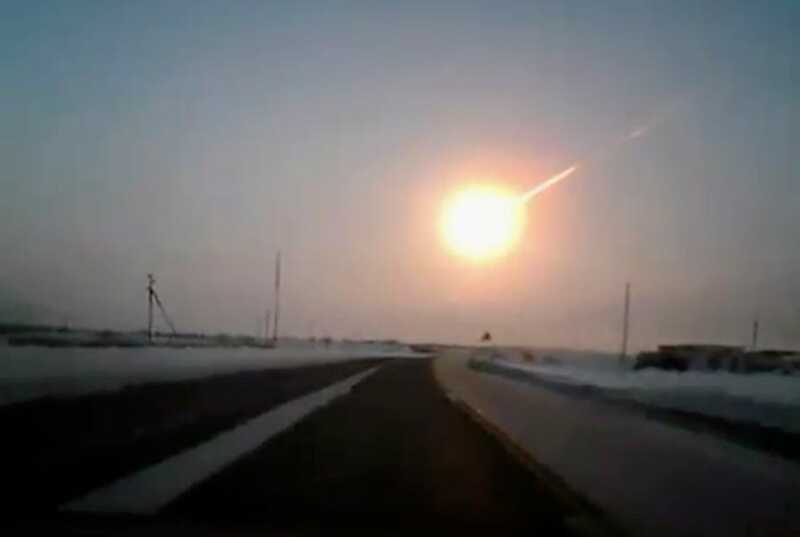 They are restricted to study their subjects with light—infrared, visible, ultraviolet, x-rays, gamma rays and radio waves—that the objects emit or reflect light from another source. 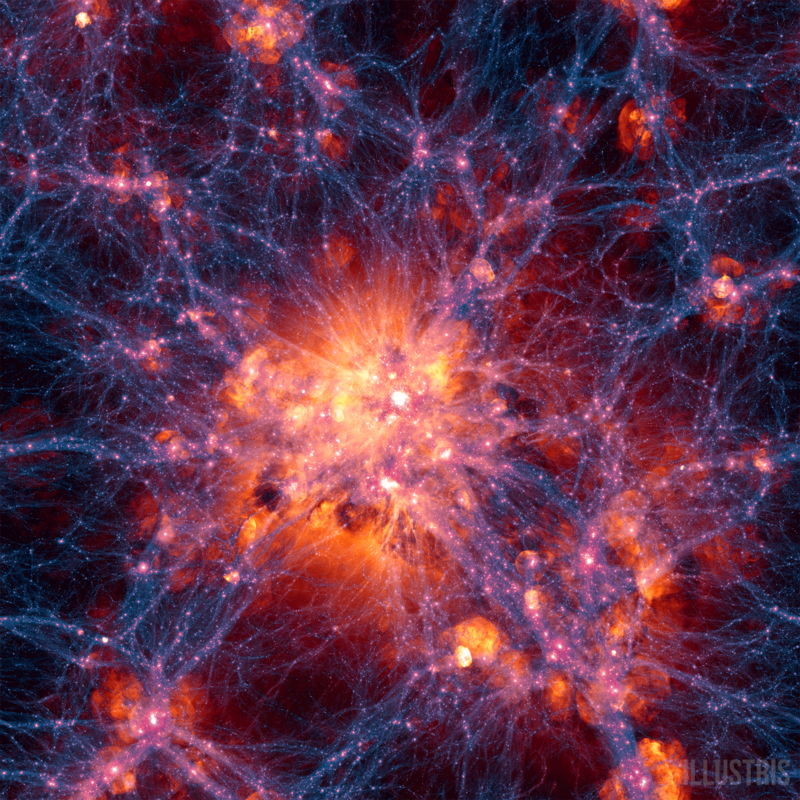 Early formation of a galactic cluster along webs of dark matter – Credit: “Illustris Collaboration” / “Illustris Simulation”. 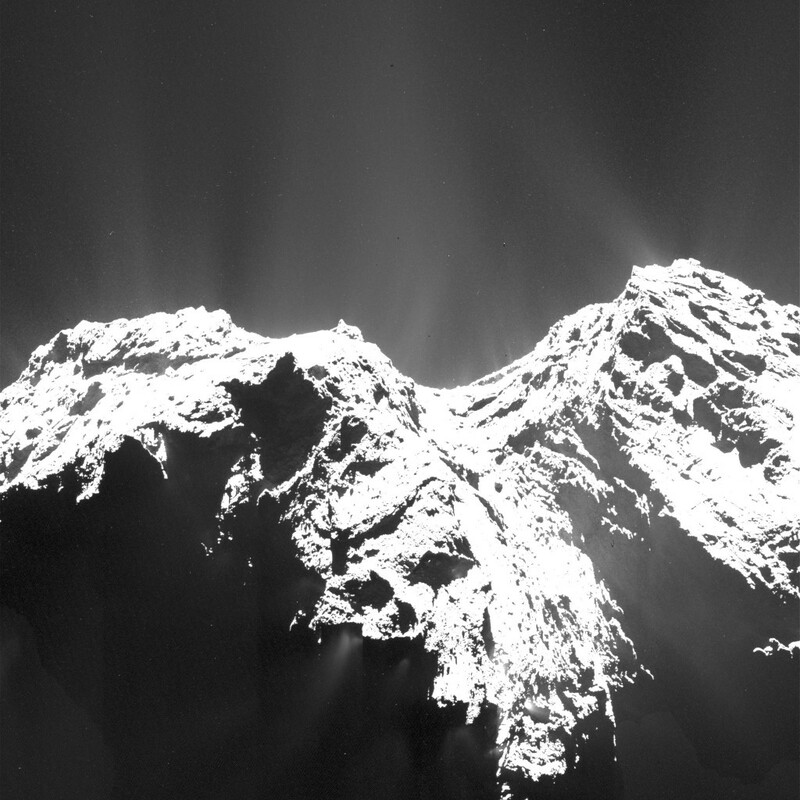 So how do they study these distant objects? They take pictures in light that ranges across the spectrum, and they gather the spectra of these objects. The spectra consist of the light emitted and/or reflected from the objects, broken down it into its constituent parts which indicates what elements are absorbing or emitting the light energy. They then apply statistical analysis to the reams of data they’ve collected to try to understand and unlock the secrets of the cosmos. These scientists also create clever experiments and conduct observational surveys of the cosmos to provide them with data they can use to further develop their theories. And, they create models. They build computer models to test their theories and see if their models replicate or even come close to matching what they can see in the heavens above. These models are used to predict everything from stellar evolution, planetary atmospheres and black holes to galactic structures and clusters to name a few. There are those that aspire to reach even further. They want to model the evolution of the Universe from the dawn of the big bang to the present day. A team lead by Mark Vogelsberger (MIT/Harvard-Smithsonian Center for Astrophysics) have done just that. They have developed a sophisticated model of a piece of the Universe (a cube about 326 million light-years (ly) on a side) that incorporates dark matter, as well as normal visible matter. The model, called Illustris, shows the evolution of the Universe from about 12 million years after the big bang to present day, and it maps out the cosmic webs of dark matter, along which normal visible matter collects. The amazing thing about this model is that they can zoom into it and display structures as small as galaxies like our Milky Way galaxy, which look like they could have been photographed by the Hubble telescope! 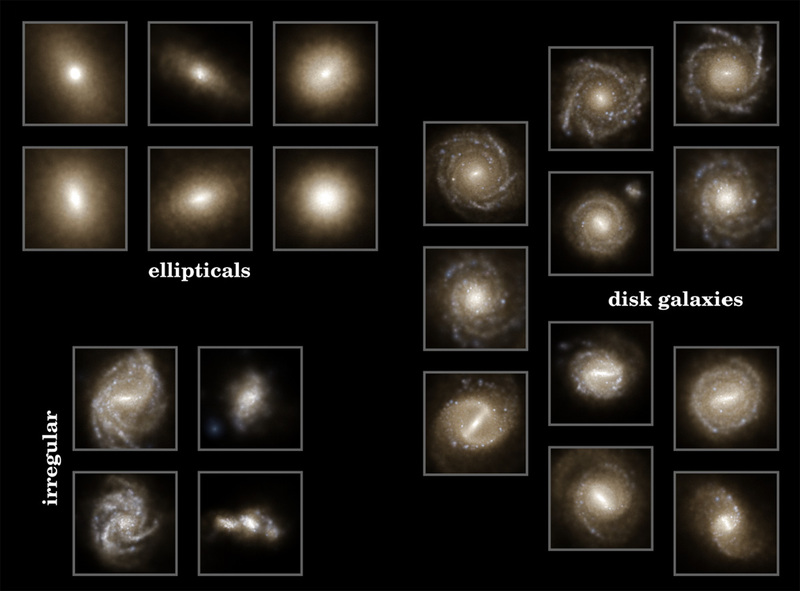 These simulated galaxies exhibit similar chemistries to the galaxies we study today. The team worked for over five years to develop this model, which incorporates over 12 billion 3D pixels to describe the sample of the Universe. If one were to try to run this simulation on a desktop computer, it would take over 2000 years to finish the calculations. Fortunately, the supercomputers used generated the simulation in 3 months of computer time. The end result contained over 41,000 galaxies embedded in the cosmic web of dark matter and visible matter. 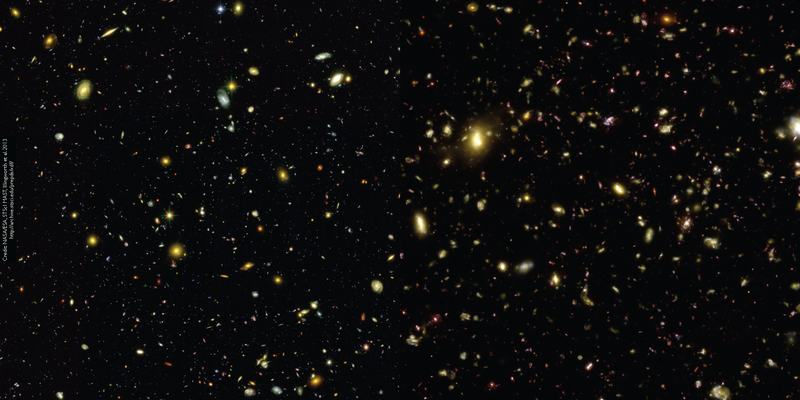 Below is an amazing comparison of the Hubble eXtreme Deep Field image on the left and on the right side, an equivalent image produced by Illustris. Take a look at the fascinating videos of this project: Nature – “A Virtual Universe” (narrated and about 4 minutes long) and a longer, unnarrated video “To Compute the Laws of Nature”. Also, check out the Illustris, website for more detailed information and additional images and videos. Playing hide and seek with my children when they were really little was always fun, especially in the beginning when they didn’t realize that I could see them when they covered themselves with a blanket or pillow. In a way, it’s similar with this image of the supernova remnant, DEM L241 located in the Large Magellanic Cloud, a small dwarf galaxy that orbits the Milky Way galaxy. The nebula is the result of a supernova which occurred in a binary star system. 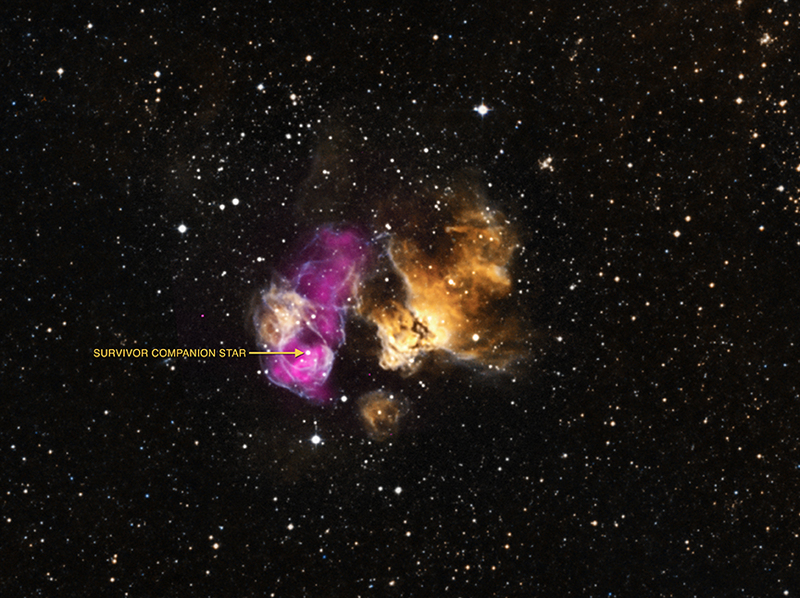 The star that is highlighted in the images below is the large companion star that survived the explosion of its partner, which now exists as a black hole or neutron star and is hidden from our view—almost. 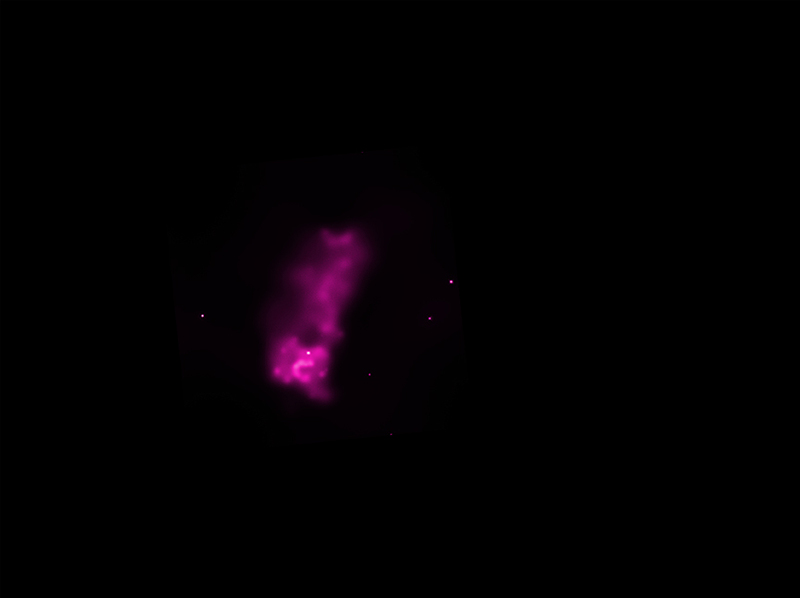 The above image shows a cloud of dust and gas with a dramatic swath of purple cutting across it. This is a composite image showing the view in the optical (visual) part of the spectrum and the same region in X-rays taken by the Chandra X-ray telescope. (See images below.) The large star of the pair is visible in the optical image and when we look at only the X-rays emitted from the region there is a bright dot in the same spot as the star – the black hole or neutron star hiding from us in the visible part of the spectrum. When these images are superimposed the black hole and the star align. 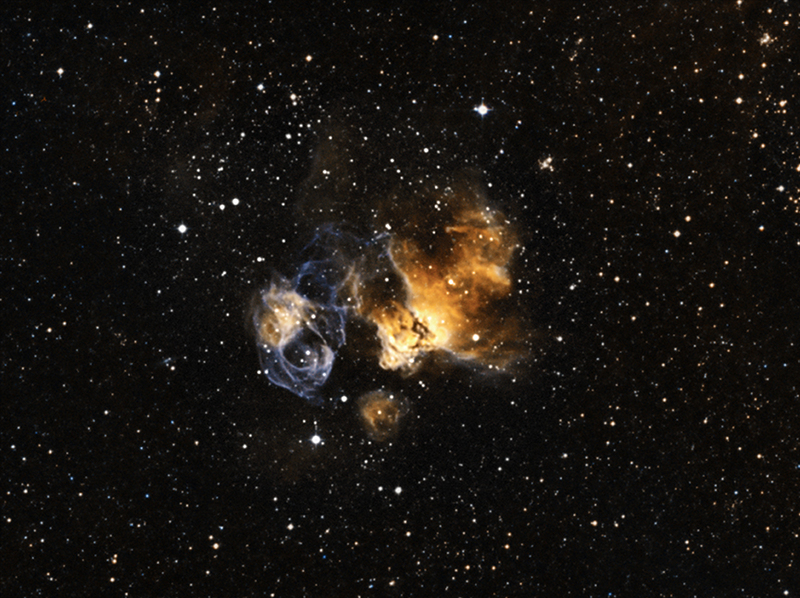 What is remarkable is that this companion star survived the explosion of its partner. The super-dense companion gives itself away in X-rays because it is pulling in surrounding material, possibly from the nearby star, which gets heated to tens of millions of degrees by friction and radiates light in X-rays as a result. The progenitor star for the X-ray source was probably a super giant with a mass at least 25 times the mass of our Sun. The surviving super giant star and the black hole / neutron star orbit each other with a period on the order of tens of days, so they are fairly close together. More in-depth observations of the pair will help determine if the hidden companion is a black hole or a neutron star. The surviving companion, being a super giant star, will eventually follow the same path as its partner and explode in a supernova, leaving behind a black hole or neutron star. This newly transformed celestial body will dance a pas de deux with its old partner for billions of years as the light from the supernova eventually fades to black. For more information check out the Chandra X-ray telescope’s website. On February 26, 2014 NASA announced that the Kepler Space Telescope had found 715 new planets. This is 715 verified planets, not planet candidates, as has been released in the past. 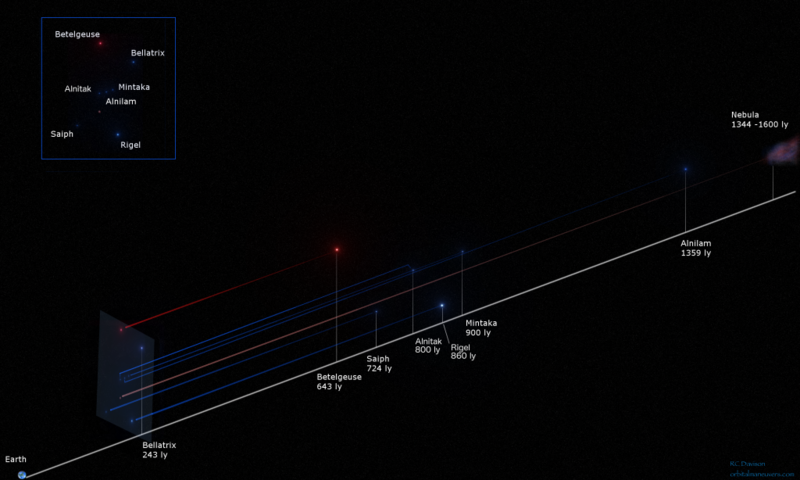 This brings the total of verified planets to almost 1700, while the number of planetary candidates is over 3800. These planets orbit around 305 stars and are all multi-planet solar systems. This is significant because the techniques established to verify these planets bypassed the process where other ground/space based observatories would observe the stars associated with planetary candidates to independently verify the presence of orbiting planets. This was done by measuring the transits of the planets or the star’s “wobble” as the planets tug on the star during their orbit. (For more information on these techniques, see the blogs Finding Exoplanets Part 1: The Transit Method and Part 2 – It’s All About the Mass). Within this collection of planets we have four that orbit in the habitable zone of their parent star (meaning liquid water could exist on their surfaces) and are less than 2.5 times the size of Earth. An important thing to keep in mind is that these results come from only the first two years of Kepler data. There is over another year’s worth of data yet to be released on Kepler’s discoveries. Unfortunately, Kepler ended its planet hunting mission last year due to failures of two reaction wheel controllers (out of 4 total, one being a backup) that are used to precisely point the telescope. Kepler served its main mission and was given an extension to keep planet hunting, but that ended in the spring of 2013 with the failure of the second reaction wheel. It’s interesting to note that having only two reaction wheels prevented Kepler from counteracting the force being placed on it by the Sun’s light pressure, causing it to be unable to lock onto the star it was observing. But, Kepler is not down and out yet as there is a proposal—K2—which will allow the spacecraft to continue its planet hunting to a degree as well as observe star clusters, active galaxies and supernovae. 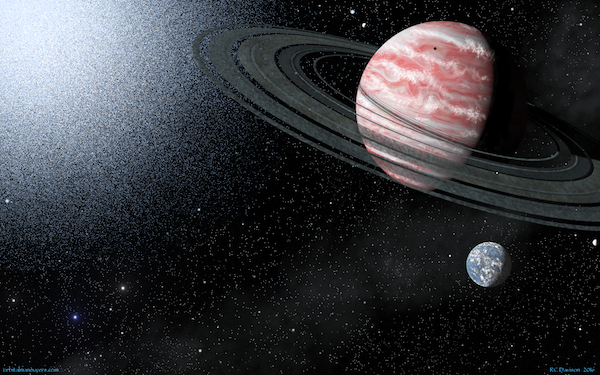 More planets, more possibilities of life elsewhere in the Universe—as we know it or not! Can’t wait for the James Webb Space Telescope to get into space and come online. The better we can see, the more we can see! I’ll leave you with a new wallpaper—Change of Season. 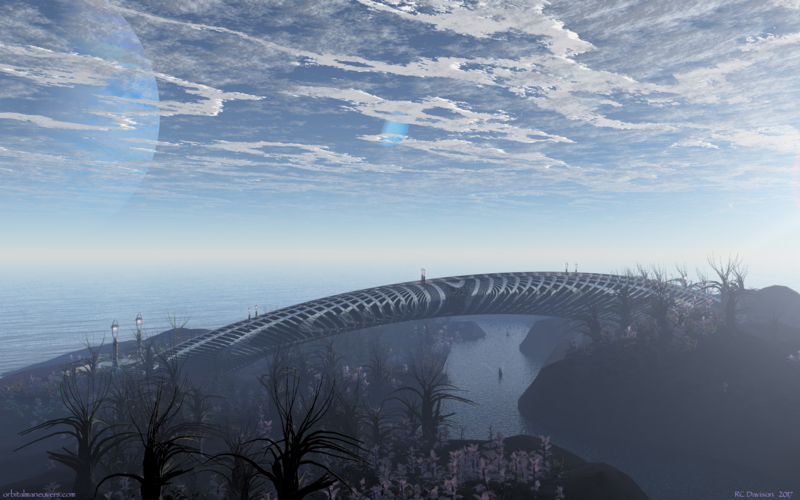 It’s not too hard to imagine an extraterrestrial planet in some distant star system, with the right geological evolution and astronomical orientation, that its inhabitants have built their own version of Stonehenge to mark the change of seasons. When we look at the night sky ablaze with stars it is very easy to interpret what we see as a two dimensional image. It’s difficult to associate depth to what we see, because all we see are points of light of varying brightness. We do equate distance with brightness, but overall it’s hard to get a real sense of depth in the night sky, partly because distance can be camouflaged by an object’s brightness. 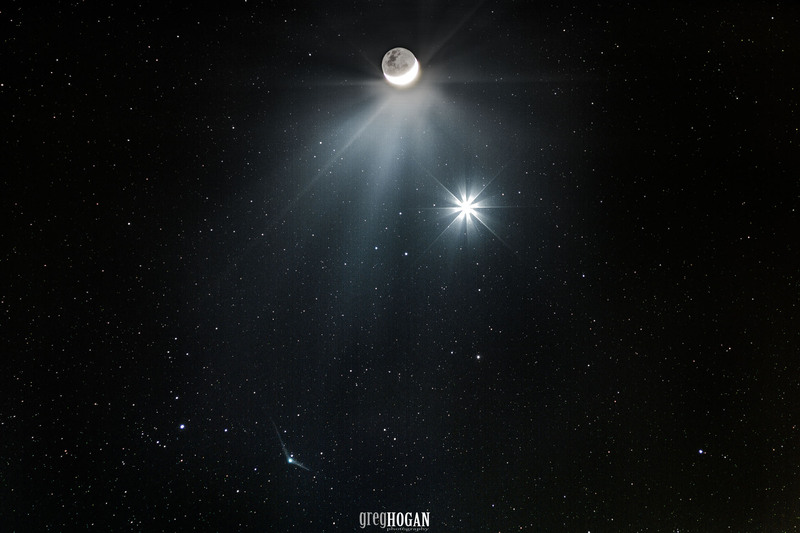 The Moon and planets give us a little bit more of a visual clue, being bigger and brighter, but that may be more because we know they are closer and not because we perceive a distinct difference in distance. It’s easy to see why the ancient astronomers constructed crystalline shells to transport the stars, planets, Sun and Moon around the sky. The stars were the easiest, as they slowly shifted with the seasons and never changed position, but the planets, Moon and Sun (not to mention comets!) were a different story, and their observed behavior led to very complex solutions to explain their motions. The constellation of Orion, the great hunter, floats across our night sky as the seasons change, just as it did for the ancients. It is a good example of a two dimensional construct that exists in a very three dimensional form—the stars and nebula that we see in Orion are not all at the same distance from Earth. If we could take a ride on a starship and gain a new perspective on this mighty constellation we would see a very different arrangement of stars. Check out the illustration below. This new perspective allows us to see that the star in Orion closest to Earth is Bellatrix, a blue-white supergiant, at 243 light years (ly). The next closest star is Betelgeuse, the amazingly large red supergiant star at 643 ly. In the not too distant future we will have a ringside seat to a supernova explosion, as Betelgeuse will end its life in one of the most spectacular events in the cosmos. The next closest star to Earth is Saiph, a blue supergiant that anchors the right leg of Orion. Saiph is followed “closely” by the brightest star in the constellation, Rigel, a blue supergiant about 17 times bigger than our Sun and part of a binary system. Although Saiph and Rigel are both blue supergiants, and Saiph is closer to us, it is dimmer than Rigel. The reason for this is that Saiph is hotter than Rigel and it radiates more light in the ultraviolet end of the spectrum, which we can’t see and therefore appears dimmer in visual part of the spectrum we are sensitive to. The stars that make up the belt of Orion, Alnitak, Alnilam and Mintaka are all very similar second-magnitude stars, again blue-white supergiants. 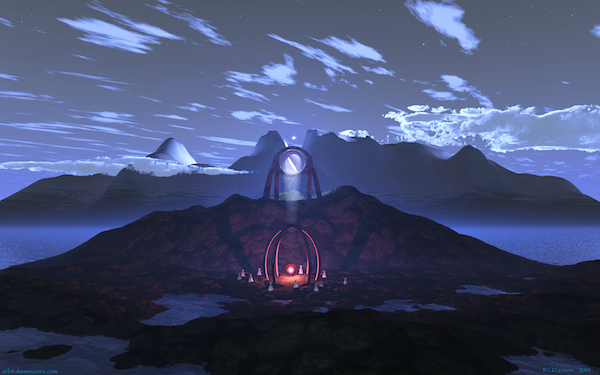 Alnitak has two smaller companions, making it a triple star system. Alnilam, the most distant of all the stars in the constellation at 1344 ly, makes up for that distance by being the brightest star in the belt. Mintaka is the right-most star in the belt and it is a binary star system with a small companion star. The stars that make up the constellation of Orion, aside from Betelgeuse, are all hot, young supergiant stars that will end their lives in a supernova. Betelgeuse is just an example of what’s to come, having already entered its red giant stage. They all formed from the same molecular cloud, tens to hundreds of millions of years ago. There is one more element to Orion that we can easily see with the naked eye, and that is the Orion Nebula, just below Orion’s belt. This nebula is a nest for new stars to form and there are many images on the web that show this in great detail. The nebula is not “within” the constellation as we might imagine it to be but is further from us, with published distances varying from 1300 – 1600 ly. The video below gives a very nice 3D fly through the Orion Nebula. Water was once a commodity only thought to exist on our blue planet (once we got past thinking that Mars had a canal system and Venus was a tropical paradise! ), but as we have advanced our technology and our observation techniques we’ve found evidence of water on our Moon and Mars and now on exoplanets a 1000 light-years away. The more we look, the more we see that elements and conditions for life as we know it in the Universe are more common than we thought. NASA has released a study that has detected water in the atmospheres of five exoplanets: WASP-17b, HD209458b, WASP-12b, WASP-19b and XO-1b. These planets are very large and orbit very closely to their stars, earning the moniker, “hot Jupiters”. So they may not be havens for life as we see on Earth. But, it does point to water being present in those solar systems, and there may be other planets around those stars yet to be discovered in the habitable zone that also have water and moderate temperatures more conducive for life. Not to mention moons about those planets that also may be habitable. The Hubble Space Telescope was used to observe the starlight as it passed through the atmospheres of these planets and astronomers teased-out the water signatures from the resulting spectra. The video below describes this discovery and the techniques used in finding the water. It moves along pretty quickly, presenting a lot of information, so you might want to pause it or play it again to pick up on the details. What amazes me is that we are able to glean this information about these planets’ atmospheres at the distances of 500 to 1000 light-years. This is only one more example of the ingenuity and inventiveness the astronomical community has applied to pushing the boundaries of our knowledge. There was a time when the consensus was that we would not be able to detect planets around another star, but in 1992 two planets were discovered around the pulsar PSR 1829-10. This was a surprise in that astronomers didn’t think a pulsar would have planets orbiting them. The first planet found around a Sun-like star was discovered three years later and is labeled as 51 Pegasi b, which is about 50 light-years away. 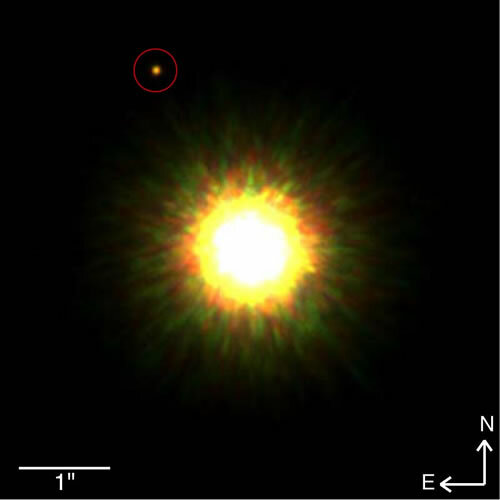 Many didn’t believe we would be able to directly image a planet around a star, but that was all changed in 2008 when a team of astronomers using the Gemini telescope in Mauna Kea photographed a planet about 8 times the mass of Jupiter around the star 1RXS J160929.1-210524, which is about 500 light-years from Earth. There were a number of other planetary images released later in 2008 by Gemini and Hubble. As one might imagine, detecting elements and compounds in an exoplanet’s atmosphere was also thought to be beyond our reach, but that too has been disproven with this latest discovery. How long before we find oxygen, indicative of biological processes or the compounds of smog, indicating a potential industrialized society, around some other exoplanet? These are good examples of what the human species can achieve when facing a challenge. We should have more faith in our abilities and realize that there is very little we can not do if we set out minds to it. 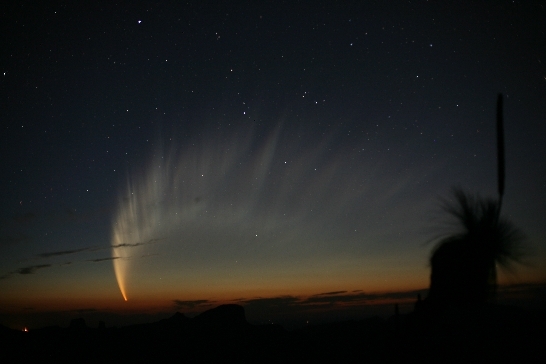 Who knows what else is out there to amaze us!